Added by Indo American News on September 18, 2014. 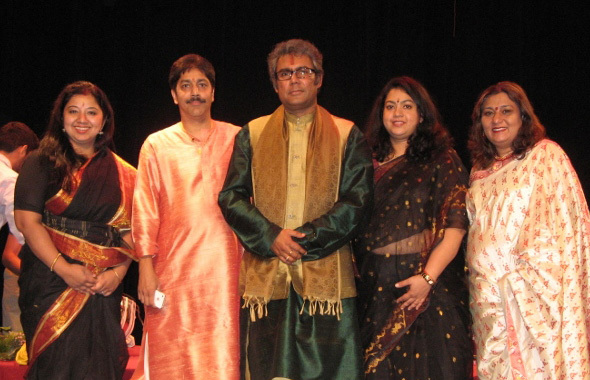 HOUSTON: The classical music night arranged by the Tagore Society of Houston at the HDBS Sur auditorium on Saturday, September 13 left an indelible mark on every member of the audience due to the high quality of the music presented. The entire evening was divided into three sections beginning with none other than the local Houstonian vocal virtuoso Pandit Suman Ghosh. His ensemble of Pandit Shantilal Shah on the tabla, wife Shashikala Ghosh on the harmonium and senior disciples Sucheta Roy and Gopa Mallick on the tanpuras made the music come to life with their able accompaniment. Panditji’s soulful renditions began with his own compositions on raga- Rasik Priya in vilambit ektaal and drut teen taal, followed by raga Jhinjhoti Tarana in drut ektaal. Being a Bengali and a Tagore fan, he could not resist the temptation of performing part of Bhanusingher Padabali, a Tagore composition in raga Bhairavi. Then ensued a bhajan by Kabir – Tu Hi Tu in Raga Gawati and Taal Kaharwa. 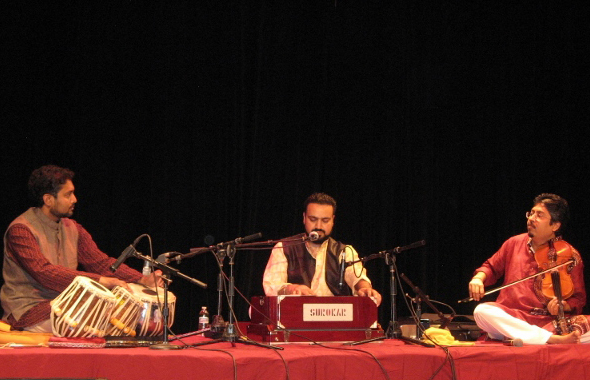 The climax was again another original composition by Pandit ji totally enchanting the audience. The next performer Hans Vermeersch had traveled all the way from Belgium to be a part of this show. He has the unique achievement of being a solo violinist from Belgium who specializes in playing the music of Rabindranath Tagore, Qazi Nazrul Islam, and several other Indian based themes like the Ramayana, etc. He is the founder and lead violinist of the Rajhans orchestra which has toured all over the world with their Indo-European fusion music and have also played with the Indian Army in Flanders Fields. His passion for Indian music and specially Tagore compositions was very evident in his hour long presentation when he played one piece after the other with effortless ease capturing the audience with his impeccable strokes on the violin and his playful charm. Although not hailing from Indian roots, he immediately made a connection with the audience as they enjoyed the sounds of the monsoon, “Jhoro jhoro”, the autumn leaves, “Shoroto aalor”, the romance of “Tumi kemon kore” and the drama of Ravana’s battle woes with his army when he fought Lord Rama. The icing on the cake was the final presentation of the night by the immensely talented Houston trio of Raja- Biplab and Balkar. The three took everyone to a new musical height difficult to surpass. As the night grew, so did their musicality and the understanding between Raja Banga, the local Tabla favorite, Biplab Samadder the well-known local violinist and Balkar Singh, the man with the golden voice was just perfect. In keeping with the theme of the show , “Confluence”, they brought together different streams (genres) of music. They mesmerized the audience with an introductory piece based on raga Kaushik Dhwani (also known as Bhinna Shadaja, or Hindoli) in Jhaap taal and Teen Taal, then went on to a playful raga Pahadi in the light/semi classical genre in Taal Dadra. This raga derives its melodic concepts from the folk tunes of the hills. Balkar stunned everyone with his original composition of a ghazal in raga Mishra Kirwani and they ended the night with a soothing bhajan by Sant Kabir based on raga Bhatiyar. Chandana Guha’s pulao, malai kofta, dahi wada and paati shaapta and Ruma Acharya’s chicken rolls were a major hit. The entire evenings proceedings were conducted by the author Sanchali Basu. Visit www.tagoresociety.org for Tagore Society’s event updates.